Mademoiselle is studying in the south of France, but she happened to be in Paris on November 13, 2015. She returned safely to the city where she lives that weekend, and the following week, her father and I hoped that she would cancel her final trip back to Paris, scheduled for the following weekend. She had planned to celebrate Thanksgiving with two American friends in Paris. But she didn’t cancel the trip, and she decided to go. We were worried about her, but also glad – especially because she stayed safe and all went well. She did get to see quite a lot, and without crowds of tourists making things difficult. I am thankful for the French army and the gendarmes. I made it back to Paris one final time! I’m so glad I came back, there was a notable increase in the number of gendarmes and army, but we saw all of the big sites, went to the catacombs, saw the Eiffel Tower lit up in tricouleur, and the Christmas markets of the Champs-Élysées! Also we had a fantastic Thanksgiving of rotiserie chicken, bread and cheese, green beans, stuffing, and mashed potatoes! And an apple tart, and champagne. This was a fantastic weekend and I can’t wait to see you soon! Mademoiselle went to Paris for 3 consecutive weekends in November: the 6th-8th, the 13th-15th, and the 20th-22nd. This carte postale is from her 1st trip, when she stayed with family friends. Their daughter Petronille stayed with us as a teenage summer exchange student for 3 weeks one year, and Mademoiselle stayed with them on the same program a year later. That was Mademoiselle’s very first trip to Paris (they live in a suburb, Montrouge), and it was before she had taken any French classes! But ever since, we have always credited Mademoiselle’s fabulous French accent to Petronille and her family. I visited Petronille and her famille this weekend and it was charmant! We walked around the 6th arrondissement, went shopping, went to the Monet museum, and got sushi for dinner in Montparnasse with her friends! It was so cool to see them all and be able to speak French with them. Plus I forgot how good their cooking was! Both lunches were the most French things I’ve ever done! *Mademoiselle’s brother Jack (whose journey with cancer is told in ALL THE ABOVE) had just been offered and had accepted a job in NYC, to start next year! After a very busy October, it’s time for vacances (vacation)! Shortly after, Thanksgiving will be here. My son who lives in New York will be home for the holiday! Book news: I’ve begun writing Book 5, another suspense novel set in Atlanta. This time, I already have a great title. Two more trips are coming up in December, but in between, I’ll be writing. 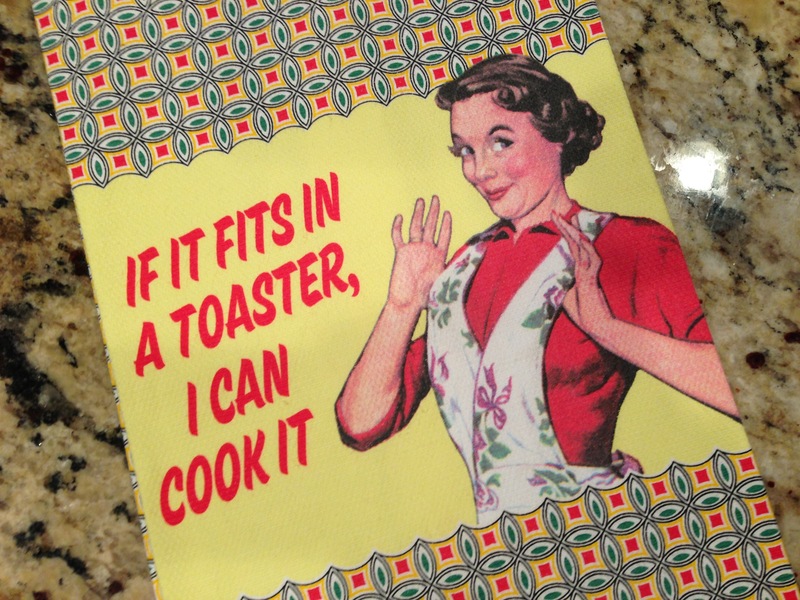 Not long ago, a dear friend (let’s call her “Lisa”) sent me a kitchen/tea towel that fits me perfectly. Lisa’s birthday is tomorrow, and I messed up and didn’t send her a gift (or even a card). So I wanted to wish her a bon anniversaire here…and tell her I miss her and am thinking of her this Thanksgiving. We live thousands of miles apart, but many years ago, we were roommates in college. Back then, she didn’t cook either, but she does now. I discovered this a few years ago when she came to visit us and helped my husband with the cooking for our annual Christmas fête. I wasn’t amazed — many women people can, and do, cook. But Lisa went above and beyond the call of a special weekend guest, chopping, stirring, baking and assembling — and loving it. She also complimented my husband’s cooking abilities and asked him for recipes. Which made him feel très apprécié. Perhaps because he is such a great cook, early in our marriage he and I lived for many years without a toaster, or un grille-pain (but we did own a funky gadget that produced croque-monsieurs.) I guess we weren’t much into toasted bread or bagels back then (and I try to stay away from them now). We finally bought un grille-pain when frozen waffles became a preferred (and easy) breakfast item for our kids. Last summer, when we were weekend guests in a French home in Lyon,* we noticed their grille-pain: it was so différent from any we had seen back in America. Made to toast pieces of French bread (baguettes) that have been sliced through the middle, not from the top, it was an interesting appliance, with its long shape and wide, long slots. My husband added it to the list of French cuisine products, ingredients, and customs (like a cheese plate after dinner) that he admired and wanted to acquire. Unfortunately, we haven’t been able to find one yet, but I may cherche (look for) one as a Christmas gift. Since our wonderful American holiday Thanksgiving is just days away, mon mari et moi (well, more him than me) are planning the menu for Thursday. We will only have seven people at the table, but he will prepare plusieurs plats traditionnels. I will contribute two simple dishes: a sweet potato casserole and fresh cooked cranberries. I’ve done them almost every year for decades, but making them will still be a challenge. Since they don’t fit into a toaster!